So what if you can’t make it to Austin for two weeks while certain friends or coworkers of yours are getting access into VIP parties and backstage privileges to live concerts? So what if they met a couple of artists and got free swag gear? And SO WHAT if you’re getting even more bitter about missing SXSW 2013 by reading this right after you proclaimed in 2012 that you WILL attend the annual mega tech-music festival next year? You’ll get over it. SOME-thing is better than nothing, and the something that happens to be WAY better than nothing is the 6th annual South By So What?! Music Festival being held right here in Dallas! South By So What?! 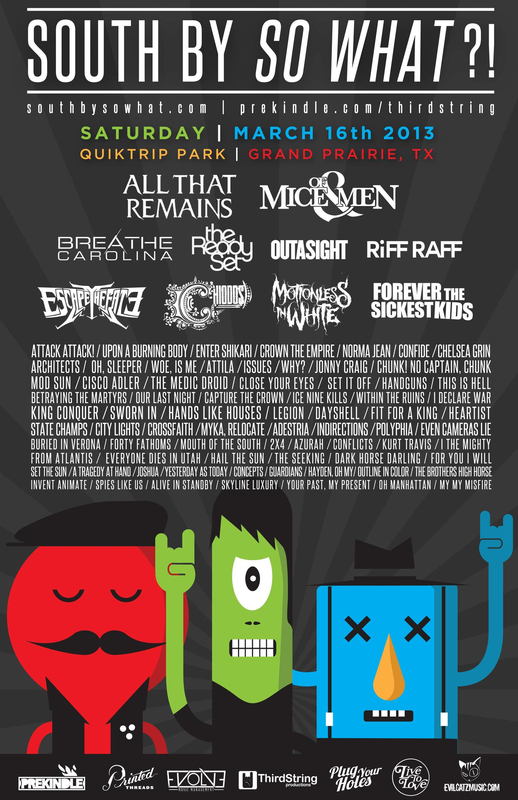 2013 will be at QuikTrip Park on Saturday, March 16th with more than 80 bands on four stages. That’s right! Get your own local dosage of SXSW (Dallas Edition) without having to drive for 3 hours or hop the Mega Bus. Enjoy a nice mix of musical genres including hip hop, pop, indie rock, metal and more. Concessions will be available as well as a private parent’s lounge for those adult’s needing a more peaceful retreat. Dallas’ South By So What goes a step further to have early access, exclusive meet and greets, ticket bundles/packages, goodie bags and posters. Tickets start at $45. Maybe you’ve done the SXSW year after and year and are ready for something a little closer to home? Check out South By So What?! This weekend in Grand Prairie, and see how we do it in North Texas. Yep, your Spring Break in DFW just got a little bit better. By the way, SBSW Dallas is a Rain or Shine event, meaning the show WILL go on no matter what! (probably with the exception of tornadoes) Click here for ticket info!